Purchase a pair of B 90, V 90 or B 70, V 70 and choose a FREE Bluetooth Accessory: ComPilot II or ComPilot Air II or EasyCall II. Purchase a pair of BR 90 or BR 70, and choose a FREE Bluetooth Accessory: ComPilot II or ComPilot Air II or EasyCall II. 0% payment plans available up to one year through Care Credit. No additional service plans or warranties to purchase. Audeo B is a Receiver In the Canal (RIC) style hearing aid and can treat from mild to severe hearing loss. Audeo B's operating system is called AutoSense OS. It automatically senses your listening environment in real-time and draws from multiple features, while accurately blending them to create over 200 distinct settings. The sophisticated operating system in Audéo B hearing aids will adapt to your particular environment and deliver unmatched sound quality. Audeo B hearing aids send speech wirelessly from one aid to the other so that both ears here speech. The V90 and V70 include a 3 year manufacturer's warranty. Audeo B-R is the rechargeable model of the of Audeo B. 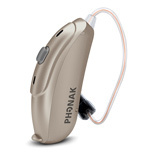 A built-in lithium-ion rechargeable battery that provides 24 hours of hearing with one simple charge. Lithium-ion batteries are quicker to charge, last longer and won’t deteriorate even after years of repeated charging. Available with easy-to-use smart charging options. No more need for standard disposable batteries. Bolero V is a Behind The Ear (BTE) style hearing aid that can treat mild to profound hearing loss. Reinforced with high-tech composite materials for additional durability it is water and dust resistant (IP67). Bolero V has been developed to automatically adapt to your sound environment and gives you the freedom to seamlessly move from one listening situation to another. The V90 and V70 include a 3 year manufacturer's warranty. 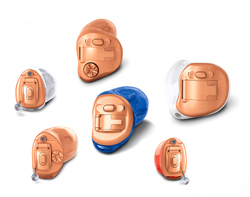 Virto V is the comprehensive custom product for mild to profound hearing loss. 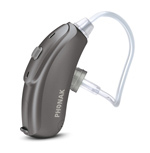 These hearing aids are the ideal solution for those who prefer excellent hearing performance and a cosmetically attractive, custom-made hearing solution. Phonak Virto V is discreet and combines the latest technology with a brand-new hardware design to provide the user with exceptional performance and comfort. The V90 and V70 include a 3 year manufacturer's warranty. Prices are the Unbundled option. Northwest Professional Hearing is a "Bricks and Mortar" hearing practice with over a decade of experience. We will support you for the life of your hearing aids.